Recently got a new modem and (supposedly) have 75 MB through Comcast. Wifi was terribly slow (5MB tops). Called Comcast and they sent a tech who "re-wired" the entire house. WiFi is great when in same room (living) as modem/router combo, move over one room (family) and it goes back to 5MB, head to any bedroom and no internet at all. Network name still shows up, but there is, "no internet connection." Is it a 5GHz connection? Those are notorious for good speed but crap connectivity distance. Most new routers offer the newer 5GHz as well as the standard mode, which sacrificies speed for reliability (over distance). It's possible that your ISP tech was a maroon and has your router set to only broadcast one side. It's pretty simple to check. Go to 192.168.1.1 (or 192.168.0.1) in your browser. That will take you to your router settings page. Reference the side or bottom of your router for the login details. The interface is relatively idiot proof, and you'll be able to check everything there. LMK if there's anything else you are having trouble with. Sorry, should have clarified that. Router has both 2.5 or whatever it is and 5. Lap top can't connect to 5 for whatever reason, but the 2.5 is the one that works fine if you're in the same room. Phones connect to 5 and 2.5 just fine. If you're having issues on the 2.6 I'm leaning towards bad hardware. That's pretty proven tech, and should cover your total house and most of your yard just fine. I'd fuss at ComCast for a new unit. What's the physical location of the box? Is it shoved up against an exterior wall that could be partially obstructing the signal? RF propagates in 360; but stranger things have happened. I had issues with my FiOS box when it was in the guest bedroom, and was blocked from the rest of the house by a load bearing wall. You can download an app called WiFi Analyzer. One if the screens in the app will show you what channels surrounding modems are on and what channels are clearest. Yea, I made sure that I'm the only one on my own channel in the 'hood. I'm probably going to have to buy a new modem and try that out. Anybody have suggestions on reliable modems? 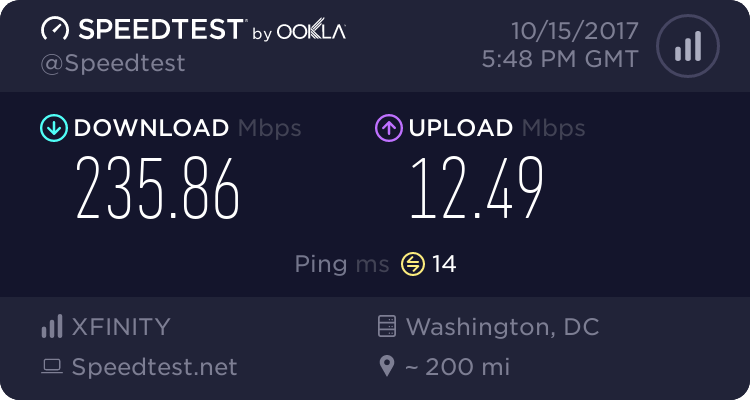 Moved modem to bedroom and same issues: bedroom now has internet and is lightning fast but no other room in house on 2.4 can even connect. Smart tvs in each room on 5ghz and Roku stream great hd quality in any room no matter location of modem. Could it be the laptop? Am I able to hook up this combo modem/router to another router located elsewhere in the house, would that help? Modem does not have an antenna plug. Thanks again for any suggestions! I also have Xfinity Internet service. I use a Motorola Arris Surfboard 400 Series modem and a Netgear Nighthawk AC1900 wifi router and have good signal throughout my house as well as outside. The equipment is located in an upstairs bedroom and I'm able to stream TV shows on my downstairs TV (using the 5g network) with no lagging issues. The 3 tests below were from taken on my iPhone. The top one was upstairs (5g). The middle one was downstairs (5g). The bottom one was at my office a few days ago without wifi. Like Rocker said, you may have some sort of hardware issue going on. Also confirm with Comcast .. some cable modem's don't align to the signals they send out .. I had issues with a few different models, and reluctantly went with NetGear and it's incredible. It could be the firmware. Buc2 wrote: I also have Xfinity Internet service. I use a Motorola Arris Surfboard 400 Series modem and a Netgear Nighthawk AC1900 wifi router and have good signal throughout my house as well as outside. The equipment is located in an upstairs bedroom and I'm able to stream TV shows on my downstairs TV (using the 5g network) with no lagging issues. You should just get a plain old SB Modem(no wifi), and buy an actual router. Buc2's preference isn't bad, but I prefer ASUS for my wifi routers(though I just use them as APs). I think this is the newest model of the one I have(I'm still using a dual band 'N' router(two of them actually)). I hadn't heard of thewirecutter.com. I'm definitely going to add them to my reviewer sites. I like CNet too. I thank you for all of your input! Weird thing. I borrowed my brother's lap top and his was getting lightning fast speeds throughout the house. I opened my laptop up right next to his and the speed matched his. Took both laptops to each room in the house and other than the farthest bedroom, the speeds on my lap top were fast (enough) for my liking (25-30 mbps). The smart TV in the "slow room" can still stream HD quality through Roku so it appears (for now) to work just fine. Again, thank you for the suggestions!